My current car does have a sunroof that I use regularly, and the vistaroof is obviously amazing. We just can't decide if we should get the one that we can afford now, or if we should wait a bit longer, save up some more $$ and get a new 2008 with all the bells and whistles, including the vistaroof. Yes I know, what a problem to have. But I truly can't decide if I am just being a baby and I don't NEED all the vistaroof, etc. or if it truly is worth it to wait a while and get a nicer vehicle. Anyway, I need your opinions. What do you think??? Currently listening to :: Break You by Hawaii. my take on it...get what you really want and in the end you'll be much happier. it's no fun to say "i wish we would've got that super cool vista roof!" i'm the same way, i jumped on a good deal( b/c i was so excited to get a new car! ), but wish i would've held out to get my SUV with a sun roof! 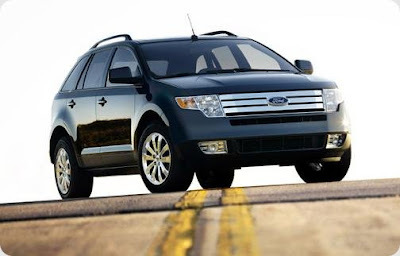 good luck with your decision and i ♥ the ford edge! nice choice! Life, as I know it. your new twin sized bed. hate is safer than love. the little house that could. cryin won't help you now. feliz de cinco de mayo.